Ritchies Mill, home of the Stillwater River Cafe. You can lead a man to Stillwater, but you can’t stop him complaining about the tiny portions. Or can you? Local girl Lucy Barbour recently put that old Tasmanian adage to the test at Launceston’s finest dining experience. Hats off to men who can appreciate small portions of fine food. Or at least pretend to. I’m thinking of the times I’ve dragged my boyfriend into swanky restaurants, when I’ve drooled over tiny dishes with complex flavours and floral garnishes. “It’s interesting,” he’ll say of an entrée of eel with a sauce that marries Vietnamese herbs with Middle Eastern spice. But I know he’s thinking, “What’s wrong with a steak?” In some ways I understand his dilemma. But I’m grateful that he keeps his mouth shut. Lime grilled Tasmanian flathead on squid ink tapioca. During a recent family pilgrimage back to Launceston, my mother booked the four of us in for dinner at the Stillwater River Café and Restaurant. Executive Chef and co-owner Don Cameron has a reputation for unique and intriguing culinary experimentation, even occasionally colliding Italian with Asian, and his serving sizes are more about quality than quantity. So I’m afraid poor Dad’s stomach was rumbling before we’d even left the house. Waitress Bronwynn sets a table in the dining room. 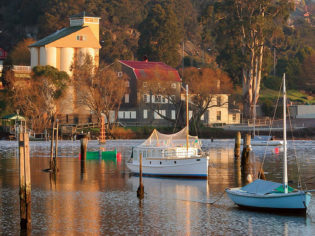 Tucked away on the banks of the Tamar at the site of an old hardworking flourmill built in the 1840s, Stillwater opened a decade ago. And when it did, our small, restaurant-starved city was overjoyed. Now there were two decent places to eat in town (although the other, Fee and Me, sadly closed its doors in October 2009). Since its very beginnings, Stillwater has earned commendations and awards nationally and internationally. On the evening of our return family visit, the waters of the Tamar are perfectly still, as promised. The air is almost mild. In Tasmania, we call this “balmy”. Inside, we’re shown to our table by a lovely waitress whose smile is brighter than her uniform; black hanging pants and a long-sleeved black shirt seem a tad morbid at first, but somehow it works. They’re a classy crew and very friendly. King Island beef in a noodle salad with crispy leek. Dad is delighted because drinks come served with nibbles; thin shards of wonton with homemade chilli sauce. We enjoy them with a Dalrymple Pinot Noir. The room is softly decorated in shades of burgundy, cream and coffee, with a shiny pine floor and thick wooden beams. French jazz ticks over in the background. A tall candelabrum flickers near the entrance. Our window looks out onto eight lonely yachts bobbing gently on the river’s surface. Stillwater’s ambience is smart, but not uptight, and is heavily romantic. At least for those squiring partners instead of parents. There’s a six-course tasting menu or a la carte. We opt for the latter. For entrée, shredded king prawns come cradled between two thin rounds of golden wonton. They’re set about by a mix of fresh Thai herbs, fine stringy noodles and an emerald green sauce of coconut, lime and spinach. It’s delightfully refreshing, zesty and enhanced by hints of chilli. For Launceston, it’s a saviour in an area where great produce thrives but high-end dining is lacking. Dad, a sucker for scallops, announces that he’ll “give them a go.” When they arrive, not stacked but as seared morsels dotted around white china, he’s blown away by their flavour, enhanced by specks of silken tofu, tomato ginger salsa and warm enoki mushrooms. His rumbling stomach begins to quieten. Moulting Bay oysters natural with citrus cheeks. For mains, my Harris Farm braised rabbit tart has tender chunks of meat and fresh peas cradled in shortcrust pastry. It’s drizzled with burnt-butter sauce and served with a dollop of eggplant and cumin jam. The dish is pleasant, comforting and enlivened by spicy undertones. Mum’s crispy twice-cooked duck is excellent. It comes arranged on a bed of caramelised rhubarb and baby bok choy with sichuan, star anise and master stock and has the sort of flavour that makes you want to float, mid-air, until next course. Dad and my brother try the spicy roasted trevalla and prawn with sticky black rice, egg yolk ravioli and roasted garlic sauce. The dish is confused though and the combination doesn’t quite work. Nevertheless, the boys grow full on flavour and, to our great surprise, have no room for dessert. Mum and I are concerned. We order them a white chocolate marquise with chocolate blancmange just in case. But it’s purely to justify the act that follows; we girls eat the lot. It’s heavenly. Stillwater isn’t just about fine, fancy food. The atmosphere is fantastic and we all agree that the expense is justified. For Launceston, it’s a saviour in an area where great produce thrives but high-end dining is lacking. Given that Dad’s borborygmus has subsided, we can sleep soundly knowing he hasn’t gone hungry. Where // Inside Ritchies Mill, Paterson St, Launceston. Notes // À la carte two courses $75; three courses $85; tasting menu $105 ($144 with wines). Breakfast and lunch daily, dinner Mon-Sat.